Sergio is a great musician!! !, he loves music. He’s an excellent teacher and dedicated to his students. He’s a nice person, too. Sergio is a disciplined teacher who cares about the progress of students and maintains a respectful relationship. He will always motivate you to give the best of you, without causing stress. From my experience in music with Sergio, I am always inspired by his dedication to his work. 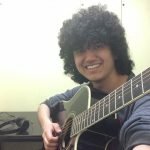 He has simple and easy to understand techniques which he uses to explain a musical concept to someone who is a beginner, like myself. Sergio is the right choice as a music teacher. He is very committed in helping you and is very clear whenever he teaches. He gives great advice and useful tips. On top of all of that, he has a great ear and is very skillful at guitar. Amazing teacher !!! I didn’t know Guitar at all before I got lessons from Sergio. Made the instrument accessible and easy to learn !